The FDA objects to claims that Génifique boosts the activity of genes, and warns L'Oreal to tone down advertising for the anti-wrinkle cream. Can the marketing claims for skin creams meant to smooth fine lines sometimes stray over the line? That appears to be the case with Lancôme's anti-wrinkle cream Génifique, whose parent company L'Oreal was slapped with an FDA warning Tuesday for portraying the product as a drug with medical properties. Advertisements for Génifique claim that it "boosts the activity of genes" and contains special ingredients that "stimulate cell regeneration to reconstruct skin to a denser quality." The FDA sent a letter to the beauty company stating that only drug products are allowed to make such assertions and Lancôme had not submitted necessary data to market its product as a drug. The agency told the company to respond to regulators within 15 business days with a plan for toning down its language or risk having its product line yanked from the shelves. Rebecca Caruso of L'Oreal's corporate communications department said the company was aware of the FDA's letter and would respond to its regulatory concerns in a timely manner. 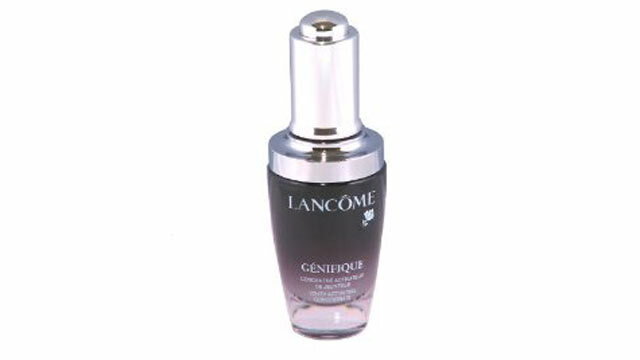 "Lancôme is committed to complying fully with all laws and regulatory standards," she said. Cosmetic companies pushing the envelope with bold promises to turn the clock back on aging skin is nothing new. But this one clearly went too far according to Dr. Barney Kenet, a Manhattan-based dermatologist. "If it truly modified the activity of the genes, it wouldn't be sold over the counter, simple as that," he said. Kenet said the warning in this case is unusual because cosmetic companies rarely get called out for making such exaggerated claims. Even when the majority of consumers find a product doesn't deliver, Kenet said they're more likely to hide the jar in the back of the medicine cabinet than file a formal complaint or a class action lawsuit. When companies do get caught, Kenet said they usually apologize, adjust the message and move on. The boost in sales is worth the minimal risk. More typically, cosmetic advertising strives to retain its seductive messaging while dancing up to the edge of what is legally acceptable to claim. For example, advertisements for ReVive Serum Presse ($295 for a one-ounce bottle) say that it "gives skin the look of instant lift and radiance…." Kenet said if the words "the look of" were omitted in such an ad, the company might be required to submit supporting evidence to the FDA. However, while New York dermatologist, Dr. Doris Day admitted beauty marketing campaigns can sometimes be misleading and over the top, that doesn't necessarily mean a product is worthless. "Some over-the-counter creams are more effective than a prescription. They may even be better than the claims they are allowed to make but they want to stay under the FDA radar so have to be careful what they say," she said. The FDA defines anything sold as a drug as intended for use in the diagnosis, cure, mitigation, treatment, or prevention of disease. The intended use of a cosmetic is for cleansing, beautifying, promoting attractiveness, or altering the appearance. A product may be both, but can only be classified as a drug if it has gone through rigorous testing that proves its effectiveness. Most cosmetic companies don't bother putting their products through independent clinical trials required for designation as a drug because it's costly and time consuming. It also isn't practical for them continually to resubmit new evidence every time they tweak their formulas. When they do, it can pay off big-time. In 2007, a popular British drugstore chain offered published scientific proof that its inexpensive wrinkle cream actually worked. Consumers practically caused a stampede through the streets of London trying to get their hands on it. More recently, Procter $ Gamble's Olay Professional Pro-X enjoyed a big sales bounce after announcing an independent clinical trial that showed it improved the appearance of fine lines and wrinkles. Day said that the majority of major brand products are rigorously tested, even if the results aren't submitted for independent review. In her opinion, many of the beauty product claims she's seen tend to be more overstated than understated. Kenet isn't so sure. He said many over-the-counter products are good but he wouldn't classify them as great. "In general, I think cosmetic companies over-claim and under-deliver. I'd like them to see them make fewer claims and deliver more," he said.